Two upward sloping parallel lines form the bearish flag chart pattern. Upward sloping top of the flag pattern holds the resistance levels and the upward sloping bottom holds the support levels.We can see in bearish flag pattern both support and resistance levels go higher and higher. 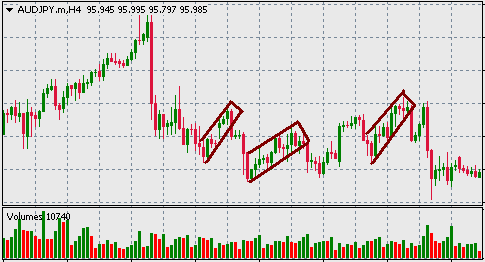 Reliability of the bearish chart pattern depends on the behavior of the volume changes along the pattern formation. Generally, the volume tends to decrease along the pattern formation. At the breakout point, the volume must spike in order to ensure the effective break out. The profit target for an order placed with the bearish flag pattern should be the length of flagpole. The stop loss of the order can be placed on the resistance levels just before the breakout point. A bearish flag pattern gives signal of trend continuation. Absence of volume spike during pattern break out is an indication of pattern failure.